Another day, another horrific traffic accident with lives, faces and families ruined. You’re looking at an overturned minibus on Pinders Bottom Main Road in St. George. Thirty seven people hurt with 5 critically injured. There’s no indication as to how many people the bus was carrying* but if you’ve ridden one of the yellow perils you know that 37 people is getting top heavy and makes bus sway and shift. Was the suspension in good shape? If a spring broke we might hear about it, but if there was a general lack of maintenance that contributed to this accident they will bury that deep. Don’t want to hurt the tourism industry you know. They might make the driver the scapegoat when the big factor was the bus wasn’t safe to drive. We’re just guessing here, but who knows what they will do. 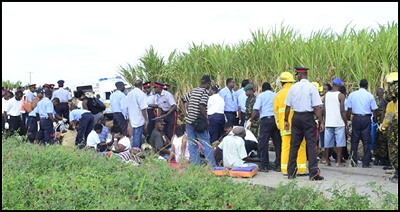 Why are we so cynical and critical when it comes to mass-casualty bus accidents? We’ve learned to be because there are never any satisfactory answers as to cause or remedial actions taken afterwards. We’ve learned. Had the driver been drinking? The police will have to guess because they have no laws or tools to do otherwise. And, once again, our Royal Barbados Police Force cannot complete a professional accident investigation because we have no laws giving them power to demand tests to see how much the driver had been drinking. Successive Barbados governments promised to pass modern anti-drunk driving laws for decades. Our BLP and DLP governments talked about setting and enforcing maintenance and driver standards for public transportation vehicles. They promised to build safer roads and increase traffic law enforcement. They promised much and delivered little. The government’s neglect proves that our leaders don’t see passenger safety in public transit as a priority. The carnage continues. Visitors from the United Kingdom have a 240% higher chance of being killed in a motor vehicle accident in Barbados than back at home. Whatever happened to this mini-bus, I’d bet my house that it could have been prevented with a little less speed, a little wider road and a little more maintenance. 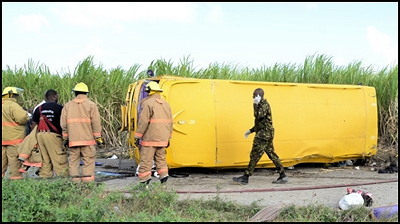 And true to form whenever there is a new mass-casualty road accident, Health Minister Donville Inniss says… don’t worry, government has formed a committee! “We’ve seen the establishment of the Road Safety Council chaired by the Prime Minister and we will be getting very busy over the next couple of months as we seek to address the issue of safety on our roads and endeavour to reduce the number of accidents on Barbados’ roads,” (Minister Inniss) said. Barbados Today: Job well done! Photos courtesy of The Nation. “Bluntly put, as soon as I handed over my deposit, I was in their complete control and getting out is impossible without significant financial loss. You buy, they earn significant commission, you sell, they earn significant commission. Worst of all, you are silenced as your deposit and income are dependent upon their success, meaning you fear providing negative information that may lose prospective investors. Which reminds me: Soon after my “holiday” to Buccament Bay (they were attempting to fill the place’s emptiness with investors), I was telephoned by Harlequin travel, requesting that I provide a positive “Trip Advisor” review to balance out negative ones. I was told this was “in all our interests”. … making clear that positive reviews by investors were “expected”. I had recently come on board, very vulnerable, and felt intimidated and forced to agree. Looking at the website “Tripadvisor”, therefore, makes me cringe. It is my personal opinion that a large number of reviews are from investors, who not only feel obliged to provide these but also are lead to believe they are aiding their own success by “bringing in business”.